Is there a TV Expert in the House? Looking to buy a 60" Smart TV. I have to re-educate myself on televisions every 5+ years when I buy a TV. I would like to spend less than $1,000 this time around. Any suggestions? The guy at Best Buy says I need a TV with at least 120Hz or sports are going to be sluggish. Is this just salesman BS? 60Hz televisions are about half the price of 120Hz televisions. Is there really that much difference? I excitedly clicked on this thread thinking "FINALLY! Something I'm an expert at!!!" But, NOOOOOOO!!! You want someone who knows about technology, not someone who is an expert at WATCHING TV! If your eyes are capable of noticing a difference between 60Hz and 120Hz, then get the 120Hz, most people can't even tell. And "sluggish" would be the wrong adjective anyway, "choppy" would be the better word. The real questions you need to be asking is do you want OLED , curved, 4k HD etc. Almost all are Smart TV's now. I was shopping at Harrod's of London last week (#humblebrag) and saw some really impressive TVs in the £25,000 range. You should get one of those! Is there a reason you are stuck on a 60" TV? 65" seems to be the sweet spot for size/price these days. Do you currently use any smart devices like a Roku or FireTV? 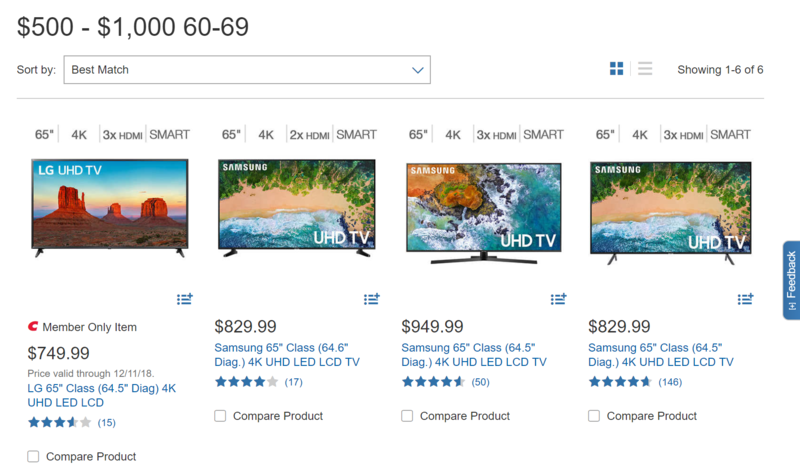 You can get a heck of a lot of TV for $600ish. ETA: the 120hz stuff is mostly salesman crap. Now, that's not going to be the OLED/SUHD, it's going to be their lower end model, but it's not a really big deal when your budget is where it's at. I'm guessing the price has come up a little bit, just cause I would assume that's a black friday deal, but gone are the days where deals are only had at black friday, TVs are always "on sale"
Yes, due to the spot it will be going, above the fireplace. That's the largest my wife will let me get with the dimensions of the mantle. It would definitely make it easier if I just went with the 65", but it's just a bit too big. You'll likely be plenty happy with that one. Had an interesting thing happen while I was buying the TV. I'm paying for it back in the TV section. There's an elderly black woman, I would say 75 years old, looking at some merchandise on the shelf near me. She'd been looking for a couple minutes, and then one of the sales guys goes over and asks if he can help her find anything. The exact same thing they do with me every time I go in, and they should do. The elderly black lady says to the young salesman: "Why, do you think I'm going to slip this in my purse?" She was looking at DVD players. To the young salesman's credit, he replies simply "Um no, I just wanted to know if you need my help with finding what you need?". She didn't really say anything else after that, and proceeded to buy the DVD player. I know, cool story bruh. Just thought it was incredibly weird/awkward. Wonder how she would have responded if he'd said "Yes, Yes I Am." Would have been REAL awkward then, lol.